Pictures don't really do this place justice..
we had a wonderful stay at Raffaela's place. We were 3 generations, where the older people were able to stay on the ground floor which was super convenient for them. The house itself is a gem - with super impressive craftsmanship. Kitchen is well stocked and modern. Views are amazing. And conveniently close to a 4 star hotel for going out for a nice dinner. Being located close to a small charming village was also convenient, though the grocery options there are not all that well stocked. It was great dealing with Raffeela, she was very helpful both before and after our trip. The only &quot;challenge&quot; during our stay was dealing with the rather steep gravel driveway. Valsiniga is a magical place. 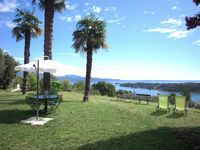 It is a place of peace in the summer turmoil of Lago Garda above the lake and Sal&oacute;, yet you can be in the buzz in 5 minutes or on a wonderful beach in 10. The house is simply perfect. The views are breathtaking. Valentina and her family are lovely. Rufus is a special dog soul who will make you feel sooo welcome. If I had to pick a place to live the rest of my life, this would be it :) The farm feeling is made complete by Olivia, the pig, the geese, the rabbit, the cats and the hens and chicks and roosters...For the latter prepare with earplugs, their mornig call is too early for a summer holiday - the only imperfection of Valsiniga.